Just sharing a tidbit from the inbox...and boy, does this one sound delicious. Who doesn't love to have a meal at a Brazilian Steakhouse where wearing stretchy pants is a requirement? Togo de Chão is bringing the experience of esparto corridor (continuous service) to Naperville. Among the flavorful, high-quality, savory meats that are roasted over a fire, are ribeye, filet mignon and Picanha (well-seasoned prime part of sirloin.) Plan on filling your appetite starting on Thursday! I am uber excited about checking out this place. NAPERVILLE, IL (January 13, 2016) - Internationally-renowned Southern Brazilian Steakhouse, Fogo de Chão (pronounced fo-go dee shown), opens its Naperville restaurant on Thursday, January 14, 2016. The new restaurant, located in the Freedom Commons dining district, is the third Chicagoland location for the brand that introduced authentic churrasco to the area more than 14 years ago. "Naperville is an exciting dining destination, filled with restaurants that feature food from many of the world's greatest cities," says Larry Johnson, Chief Executive Officer of Fogo de Chão. "We are excited to be a part of that by sharing our celebrated dining experience with this dynamic community, just like we do in Rio de Janeiro and São Paulo." Additionally, Fogo offers a gourmet Market Table & Feijoada Bar with seasonal salads, soup, fresh vegetables, feijoada (traditional black bean stew with rice, fresh orange and yucca flour), and much more. The menu is complemented by an award-winning wine list, an extensive cocktail program including many traditional drinks from Brazil such as the Caipirinha, and a tempting dessert menu featuring indulgences like their signaturePapaya Cream, Crème Brûlée, and Brazilian Flan, all of which are made in-house. 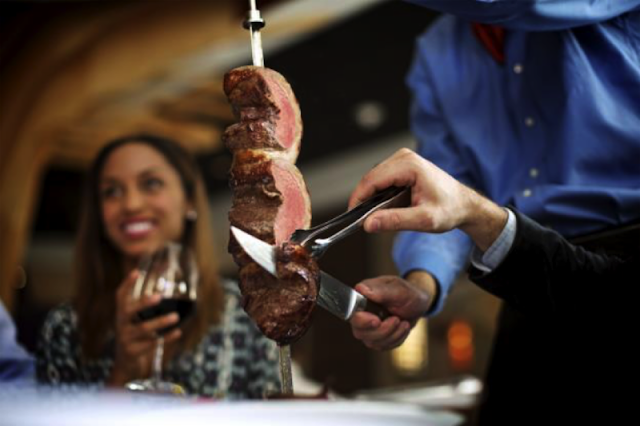 Fogo de Chão Naperville is located at Freedom Commons, just minutes away from Naperville's Downtown District. This location is one of the first to offer a new Gaucho Lunch Menu, featuring convenient options to meet weekday lunchtime diners' busy schedules. The new space also features a lively bar area that is home to Bar Fogo, the recently introduced concept offering a more casual way to experience Fogo with shareable small plates, cocktails and daily Happy Hour specials in the bar. The restaurant offers private and semi-private dining, an outdoor patio, and has a number of tech capabilities including Smart TVs in the private dining spaces, and USB connectivity, making it ideal for a business meeting, working lunch, and much more. The restaurant's design is contemporary with warm and traditional touches that pay homage to the farm culture of Southern Brazil. Guests enter the restaurant through a stately glass and steel entry tower accented with warm glowing light. Inside, a 16-foot bas-relief sculpture of the famous Brazilian statue, O'Laçador presides over the dining room. Additionally, an open kitchen showcases the gaucho chefs and the centuries-old culinary grilling tradition. The centerpiece of the restaurant is a 30-foot atrium supported by four hand-crafted abstract interpretations of the indigenous Araucaria tree from Brazil. Fogo de Chão Naperville is at 1824 Abriter Court. Sunday through Friday 11:00 a.m. - 2:00 p.m.
Monday through Thursday 5:00 p.m. - 10:00 p.m.
Saturday 4:00 p.m. - 10:30 p.m.
Fogo de Chão is a leading Brazilian steakhouse, or churrascaria, which has specialized for more than 36 years in fire-roasting high-quality meats utilizing the centuries-old Southern Brazilian cooking technique of churrasco. The company was founded in 1979 in Porto Alegre, Brazil, and expanded into the U.S. in 1997. There are currently 41 locations throughout Brazil, the United States, and Mexico, including locations in São Paulo, Rio de Janeiro, New York, Beverly Hills, Chicago and Mexico City. For more information, visit Fogo.com or Facebook, Twitter, and Instagram. For a visual representation of the story of Fogo de Chão, watch "The Gaucho Way," a documentary-style video that is shot through the eyes of real Fogo de Chão Brazilian gauchos and explores the restaurant's deep cultural roots in Southern Brazil.